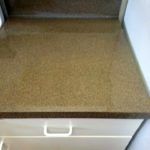 Countertop Resurfacing | The Resurfacing Doctor, Inc.
Our counter top resurfacing process involves applying a very strong and durable acrylic coating to your cultured marble, Corian®, Formica® and laminate kitchen counters or bathroom vanities. 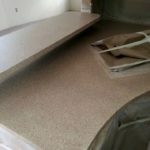 This process is much more affordable when compared to the costs of having to completely replace the entire counter top. In most cases we find that only a small portion of counters will actually need to be repaired. 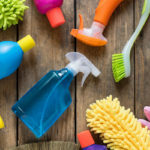 This eliminates the traditional method of having to replace the entire counter top! Speckled Countertops: Speckled / Multi-Color Finishes can be sprayed on any counter top surface. The speckle can be applied to Tile, Cultured Marble, and Laminate Counter tops. This give them a more stone accented finish. 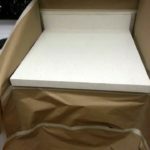 Two Color Countertops: These tops are usually requested when the existing tile already has a lighter tile with darker trim. We simply spray the entire surface the base color. Then, after the material cures, we return to tape off and spray the requested color trim. 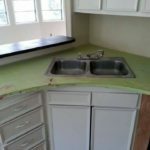 Solid Color Countertops: This is the most common and basic type of counter top resurfacing. Usually requested when a customer wants to bring life back to their white tile. Remember it is important to care for your refinishing properly once complete! Our highly trained technicians can provide you with a quote for your project and in many cases can get started the same day. At The Resurfacing Doctor our main focus is on customer satisfaction so rest assured you will be more than happy with the results. 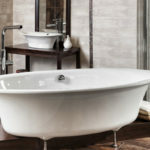 So whether you are looking for Corian® counter top refinishing, laminate, or ceramic tile refinishing in Palm Beach, Dade and Broward County we’ve got you covered! Contact Us today!